As Winter merges into Spring and the birds come together to create their orchestra and sing their dawn chorus, and the trees bow with the weight of their exquisite blossoms in shades of whites and soft pinks, I am constantly reminded that the beauty of nature is unsurpassable. 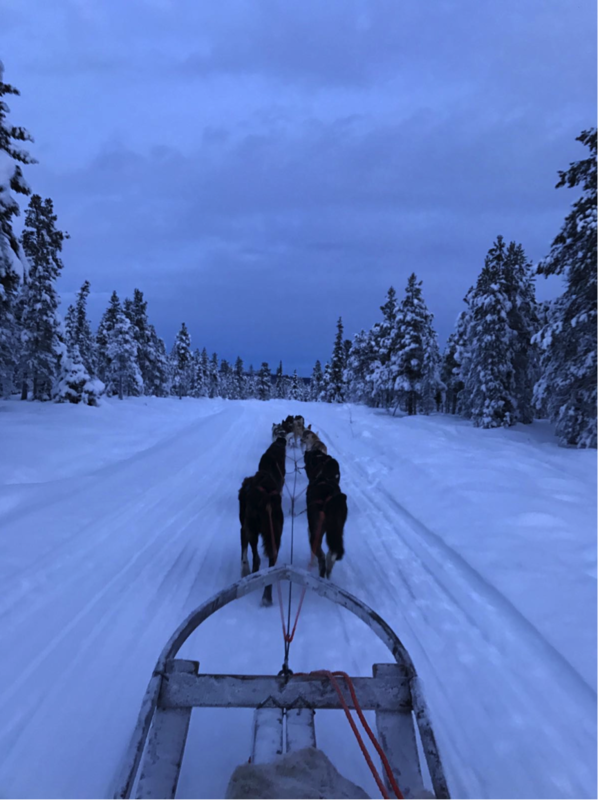 Looking back at my second favourite season of Winter, Autumn being the first, I find myself reminiscing about my visit to Swedish Lapland and the Ice Hotel last December. The memory of this trip will remain forever in my mind’s eye as one of the highlights of my life’s travels. 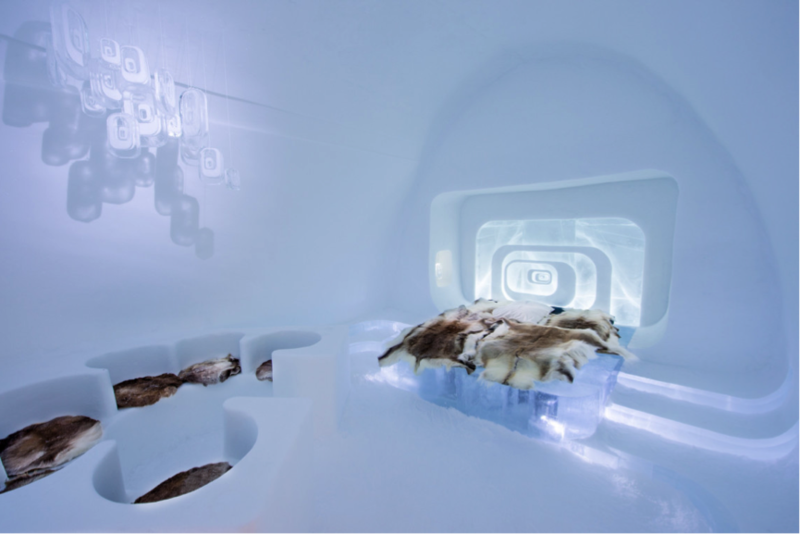 Set in the little town of Jukkasjarvi just North of the Arctic Circle, sits a magical winter wonderland and the home of the original Ice Hotel. Its location is the stuff that Christmas cards are made of. Snow covered fir trees and skies so clear at night that you can almost touch the myriad of stars above you evokes thoughts of Snow Queens in their Ice Palaces wearing crystal crowns and wrapped in pure white fur. 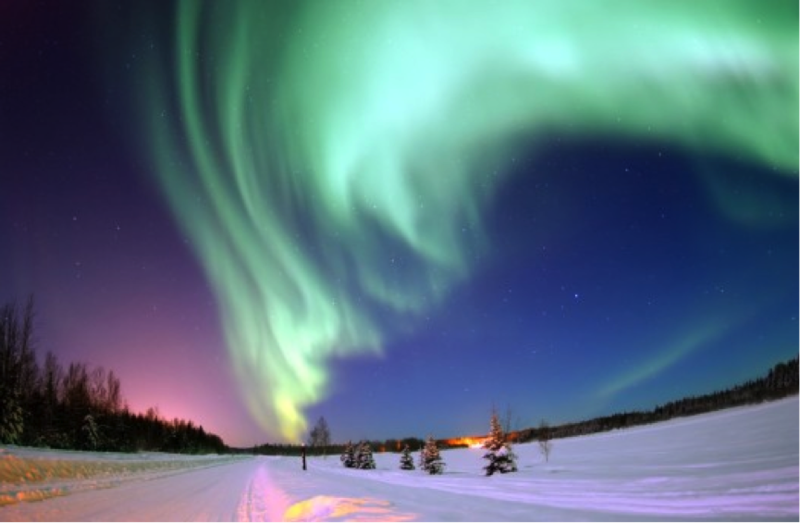 Of ice so pure that that it is almost blue, and of skies painted in hues of green, blues, purples and pinks by the Aurora Borealis, otherwise known as the elusive Northern Lights. 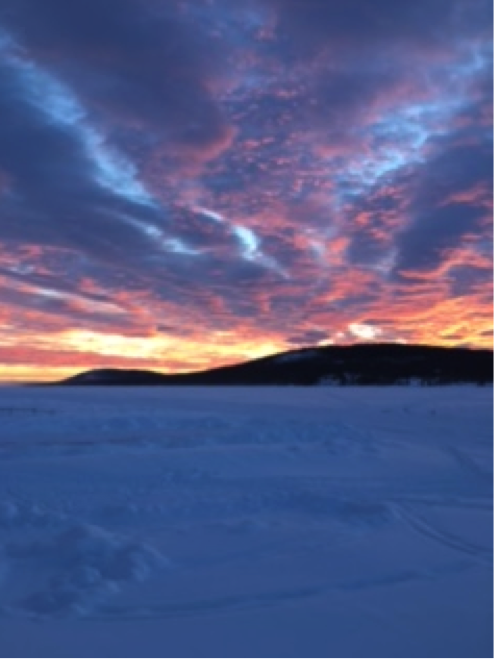 During the winter months the sun never rises above the horizon, but the sunsets are breathtaking! Hues of golden ambers and burnt oranges tinged with lavender pinks create a breathtaking scene above the hills at sunset, and with the sun and moon juxtaposed in the same sky it is a photographer’s paradise. Every year a new Ice Hotel and its Chapel, which is a unique art project, is created on the banks of the beautiful River Torne, changing from water to solid ice and back again. Reborn in a new guise each winter and hand carved by selected designers, it is ephemeral and one of the most unique wedding locations in the world. The lovely people at the Ice Hotel found out I was a Wedding Planner and I was treated to a VIP tour of the Chapel, which was still being constructed and not accessible to the public. I was truly humbled, not only by its fete of engineering but at the same time by the magnificence of its simplicity. It is a breathtaking sight to behold. With an aisle of draping chandeliers, made entirely of ice and snow (snice) and flanking columns of crystal clear ice, you could almost be forgiven for thinking you are in a magnificent Cathedral. With pews covered in reindeer skin and candle lit lanterns flanking the columns I could imagine a string quartet serenading couples and guests whilst they sip on pink champagne listening to the spine tingling music whilst the couple exchange their vows. For nature loving couples, or for those who wish to be unique, this is the perfect place to get married or to surprise an unsuspecting future bride with a proposal. Whether you are looking for a winter wonderland wedding, a Game of Thrones theme or just a magical winter wedding in breathtaking surroundings, this is definitely a location I would recommend. There are so many surreal elements to this beautiful piece of our planet and although one would think that there are constraints within what is possible for a wedding celebration, the Swedes are so versed and familiar with both the terrain and the winter weather that they adopt the attitude that anything is possible. And they make it so. Transportation runs like clockwork even when it is snowing heavily. Take note England! For me it is difficult to pinpoint the absolute highlight of this magical location but the ones that will forever remain with me are sitting on a chair lift en-route to the top of a mountain and the Abisko Sky Station whilst chasing the Northern Lights, the incredible sunsets above a snow covered frozen river, spending the night in an Ice Suite which was maintained at a constant -7 degrees, albeit atop reindeer skins and a sleeping bags tested to -45 degrees. But I think if I was forced to choose just one it would probably be the exhilarating experience of being drawn effortlessly by 12 blue eyed huskies on a sledge over the River Torne and through a snow covered forest wonderful, the silence and stillness of the location being broken only by the calling of the musher to his dogs. Stopping half way on our sledge ride to have piping hot coffee from a kettle atop a log fire that was burning brightly in the middle of a yurt, and eating Swedish cake whilst sitting on benches covered in reindeer skins. The contrast of the golden glow inside the yurt and the icy blue outside the door, the colour palate only blotted by the sight of our brown and white husky transportiion waiting eagerly to take us back home. Definitely the stuff of dreams and bucket lists!